HanWebFusion™ DELUXE includes all of the features of Plus, in addition to add-on modules that are fundamental for numerous businesses. 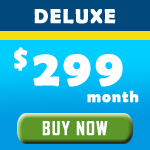 The Deluxe package provides a saving of up to US$69; SEO Marketing, Google Analytics and more. So no matter how sophisticated your online store, HanWebFusion Deluxe provides an answer for you. The Deluxe Pac comes with all of our modules included as standard.